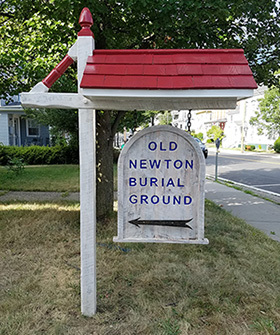 The Old Newton Burial Ground was placed on the National Historic Register in 1986 and is also included in the Newton Historic District. Access to this cemetery is between 75 and 79 Main Street – just follow the arrows on the new sign. The Sussex County Historical Society has recently reactivated its cemetery committee and it has been working hard to restore and maintain this special piece of Sussex County history. So far, the service of 41 Veterans and 1 Patriot has been verified: 10 American Revolution, 1 Ladies of Trenton, 1 Pennsylvania Insurrection of 1794, 1 Quasi War with France, 1 War with Tripoli, 6 War of 1812, and 22 American Civil War. 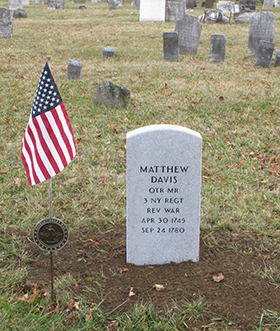 The flag markers have been polished or replaced and are now engraved. Over 70 gravestones have been cleaned and work is beginning on gravestone repairs. More volunteers are welcome. The Burial Ground consists of three parcels of land. The oldest part, which is .38 acres in the center, was set aside for a graveyard in 1762 by Jonathan Hampton, as part of the Newton Town Plot. The oldest recorded burial is located here, that of William Darby, the two year old son of Ephraim and Rachel, who died in 1770. By the early 1820s this original plot began to fill up. The trustees of the cemetery purchased a .40 acre plot to the northeast from Daniel Stuart or his estate. The Anderson family plot is located within this section. The final piece of land was given to the Presbyterian Church by Job and Ann Halsted in 1837 with the stipulation that burial would be free for all persons. This .59 acre piece to the southwest of the original section includes the Halsted family plot. It was also in 1837 that the stone wall was built around the cemetery. For a complete list of veterans buried at the cemetery please click here. George Roy transcriptions and maps drawn circa 1890-1905; written ledger of his transcriptions; six volume set of transcriptions, notes and photographs by Janet and Gordon Appleman circa 1980’s; research on the Veterans and Patriot by Wendy Wyman in 2016 and ongoing; research on the cemetery by Geoffrey Ithen in 2017 and ongoing. The entries in black are taken from the restoration project transcriptions, and all such entries have visible stones found with the Quadrant idicated. The entries that are blue denote a veteran. The entries in red denote two possibilities: (1) a person who is referred to on another stone transcription: i.e; if there is a stone for a woman and the script on the stone refers to her as “The wife of John…etc.”, then John is listed in this transcription….and (2) a transcription of found stone during the Roy transcriptions, but was not found during the Historical Society’s restoration of the cemetery. (As an example, the stone of Richard Case, son of Ellen and Peter Case, died 1861 at the age of 7 was not found during the 1990’s restoration, but was documented by Roy and it’s location noted). It is possible that a person referred to in this transcription is not buried here at all….but the listing is given for informational purposes. If you, dear reader, know indeed of the actual burial spot for a listing such as this, please share your knowledge with us. The *starred* entries refer to a burial which was recorded by Roy (see “sources”) but the stone was not found during the restoration/documentation done by the Historical Society in 1997. The “Area” field refers to the quadrant of the cemetery in which the person is interred. There are 4 quadrants that make up the burial grounds – North, South, East and West. Refer to source material located at the Sussex County Historical Society to locate these quadrants and also to view the original source documents, the restoration chronology, photographs, and documentation. The transcriptions we have online so far are categorized alphabetically below. Evi Dayton, son of Benjamin and Hester Anderson. A member of Co I 15th Reg. NJ Vols. Died at Culpepper Va. In memory of Thomas Oakley Anderson who was born in this town? son of Mary and Eli?? wife of Robert Mills Sergn. husband of Elizabeth Rarrick ?Conrad? dau of Henry J and Anne Rudd? "like a shock of corn fully ripe"
son of ----and Martha Taylor?